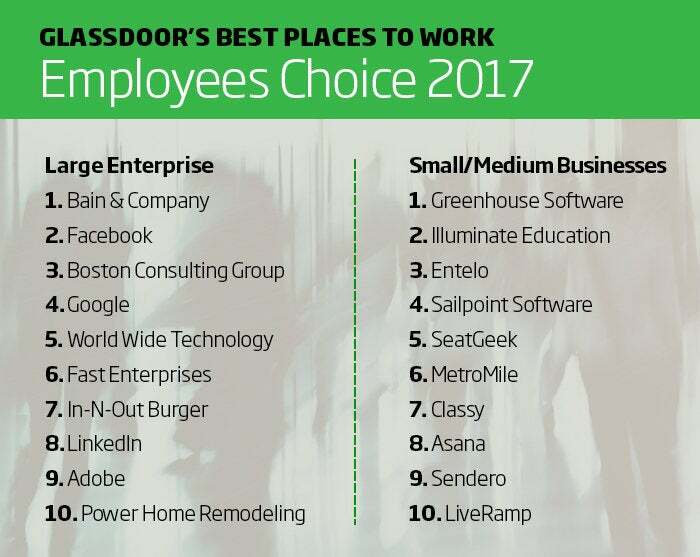 Glassdoor, the employer review site, has released its annual "Best Places to Work" list for 2017, and while there are some familiar names -- Facebook, Google, LinkedIn -- companies like fast-food restaurant In-N-Out and household brands like Clorox and Nestle Purina Pet Care are making a strong showing in the top 20. 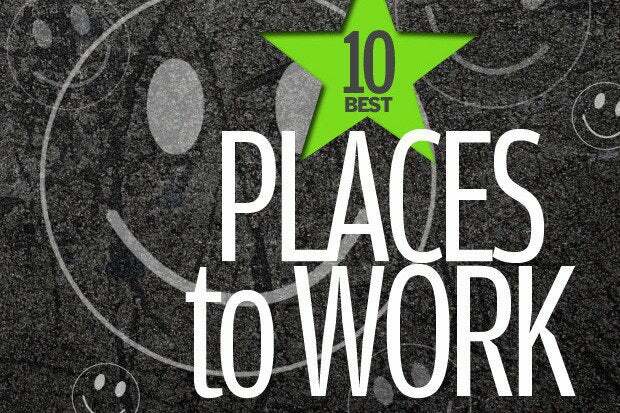 What makes a company a "Best Place to Work"? Though there's a diverse group of organizations represented on the list, there are a few common themes, says Allison Berry, public relations specialist at Glassdoor. "What we see in each of the companies on the list are common themes like employees that feel valued, that feel they are working towards a clear, shared vision and mission, that they are working with other incredibly smart people. We also see a trend of competitive compensation and great benefits as well as lots of opportunity for advancement and transparent leadership," Berry says. Technology companies do dominate the list, Berry says, and were the pioneers in offering these types of work environments and benefits to employees, but while companies like Facebook and Google really initiated the trend, other companies are starting to understand the value of these offerings in attracting and retaining talent, Berry says. "Every company is an IT company -- it's such a cliché, but it's true. Especially with tech talent where there's a talent shortage, nontech companies are competing with high-tech companies for the same kinds of talent and they have to level the playing field," she says. In other words, they have to focus on creating a culture that makes employees want to work there, and want to stay once they're on board, says Joyce Maroney, senior director of customer experience and services marketing at workforce management software, solutions and consulting firm Kronos. Kronos research from March 2016 by The Workforce Institute at Kronos Incorporated and WorkplaceTrends.com titled, "The Workforce Institute at Kronos and WorkplaceTrends Employee Engagement Lifecycle Series: Who's the Boss of Workplace Culture?" shows just how important culture is in attracting and retaining employees, and how much of a driver culture can be to an organization's success. The problem, according to the research, is that HR professionals, employees and managers don't agree on who's responsible for creating and sustaining that culture. "Culture is, in essence, that set of beliefs and the climate in an organization that can either contribute to your success or hamper it. You're going to have a culture whether you like it or not, so it's best to clearly define it, understand and make clear what it means and how everyone can contribute," Maroney says. 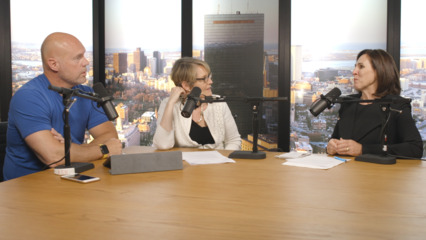 The most important factor in doing so is simply listening to your employees, which is where sites like Glassdoor, and lists like the Best Places to Work - Employees' Choice, are critical in the workforce landscape, says Maroney. "You have to pay attention to what your employees are saying about you, about your culture, and hear them when they tell you what will make them stay and what will cause them to go. Ask them what's important by doing employee surveys, focus groups, 'town hall' type meetings -- anything that will help you identify the key drivers of attrition and retention -- and then you have to act on that," she says. Building a best-place-to-work-worthy culture starts at the top with leadership that's willing to talk the talk and walk the walk when it comes to following through on improving culture, says Maroney. It's not a simple task, and requires sustained attention and effort, but such efforts on Kronos' part have resulted in increased traffic to the company's recruiting sites, Maroney says. "Senior leadership has to invest in these efforts. If someone says, 'My work-life balance isn't great,' or 'My manager is terrible,' you have to take action to rectify those things in the interest of culture. You have to identify what your culture is now, what you want it to be, and actively listen to your employees to help you get there," she says.